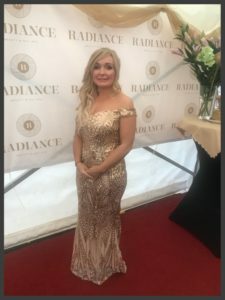 Radiance Beauty & Day Spa, Upper Lisburn Road Belfast have recently re-launched with a fabulous extension and new skincare range, and to mark the event they hosted an incredible evening at their premises to show off their range and services. 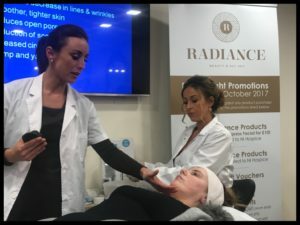 I have to confess I previously thought Radiance was just a nail bar offering some beauty services and boy was I in for the shock of my life when I seen the incredible range of treatments they offer in their Day & Beauty Spa. The Spa oozes glamour and class, everything that is the proud owner Christine Macklin, who started off 14 years ago and the Beauty & Day Spa has just went from strength to strength. 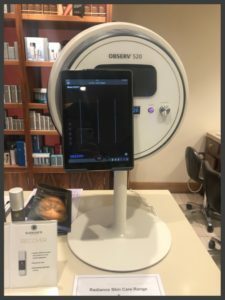 Offering everything from nails, tanning, facials to microneedling, thread vein removal and skin scanning. The evening was incredibly informative with live demos, consultations, treatments and some gorgeous canapés and drinks served while we all relaxed, mingled and got to find out so much about this incredible gem of a Day & Beauty Spa right on our doorstep. 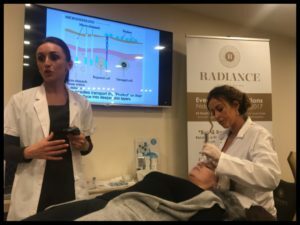 The first demo of the evening was on the revolutionary microneedling. So what is this all about? 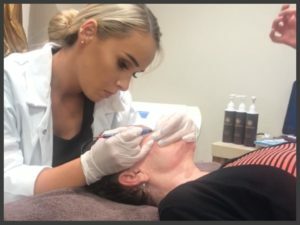 The aim is to stimulate natural production of new collagen in the skin, by puncturing the surface of the skin with tiny needles which sets off a wound healing process by making new collagen. 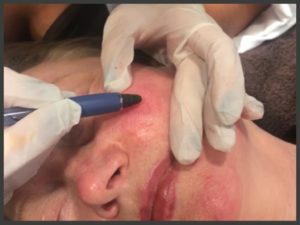 The model who was used for the demo had already had 3 previous sessions of microneedling and her skin was just incredible. She had such youthful plump skin and she said the results had been incredible she recommended it to anyone. After the procedure a cooling mask is applied and it is recommended you do not apply any makeup until the next day after the procedure. Your face will be red but this is expected and will be back to normal the following day. 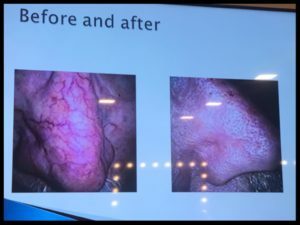 Next up we where treated to a demonstration of the Thermavein which is a thread vein removal (broken capillaries). Below are the benefits of this procedure. Also on the night we got to see the Observ 520 skin scanner in action which gives an in-depth analysis of the skin. 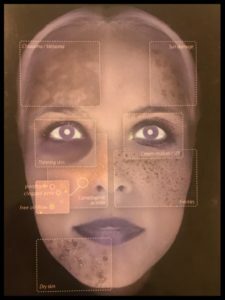 It accurately diagnoses skin conditions beneath the skin surface by taking 6 scans and photos which are then sent to an iPad for analysis. 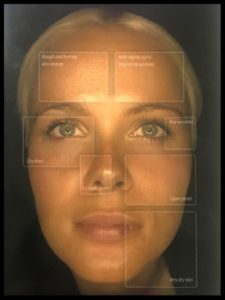 The first scan takes Daylight Mode – the face is illuminated with a diffused and soft light coming from all directions. The face and its features are evenly illuminated without shadows or emphasis on particular skin features or layers. It provides a clear and clinically reproducible means for the overall appearance evaluation of the facial skin. 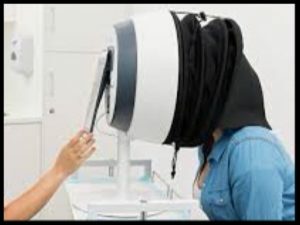 The second scan takes Cross polarised – the view into the skin is normally obscured by bright light reflecting off the surface of the skin. In the cross-polarised mode a special filter supresses the glare and reveals skin discolourations and microvascular structures hiding below the shiny surface. In cross-polarised mode, young and radiant skin may appear less sharp or out-of-focus as the light is diffused by the milky epidermis. An aged skin may become more transparent, revealing irregularities inside the skin and create a dull appearance. The third scan takes Parallel polarisation mode – The Parallel polarised mode enhances the visualisation of the skin’s surface textures. In this mode optical filters enhance the surface reflection revealing the fine surface textures, pore structures and beginning wrinkles in great detail while diminishing the visibility of skin structures and textures hidden in the deeper layers of the skin. The fourth scan takes Stimulated Wood’s light mode – the wood’s mode is named after the inventor of the original Wood’s lamp, Robert William Wood. In the Wood’s light active sebaceous glands and the distribution of the oil film become visible. Also the intensity and depth of inflammatory activity surrounding sebaceous glands is revealed. The fifth scan (and possibly the most scary!) 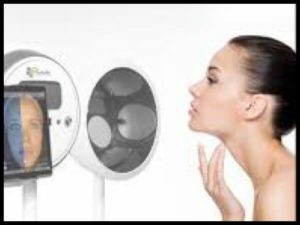 is True UV Mode – in the UV mode a low and harmless dose of UV light is projected onto the facial skin. These invisible rays have the capacity to travel into the surface layers of the skin. Inside of the skin, the cells and tissues have the natural capacity to turn these invisible rays into visible light and in this way effectively turn the skin into a human lamp. 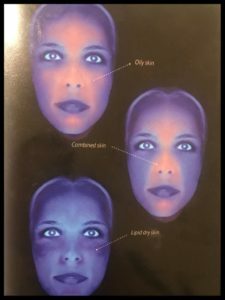 As the light is generated within the skin itself instead of being projected onto the skin, skin problems hidden beneath the skin surface become visible. 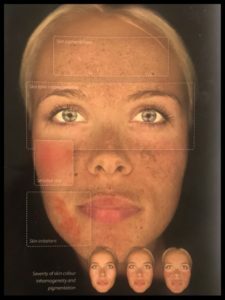 The sixth and final scan – Complexion analysis – As a result of biological aging and the accumulation of photo-damage the skin loses it overall skin tone homogeneity which it originally obtained at birth. 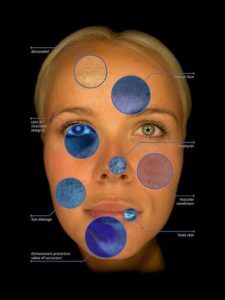 Slowly local pigmentations occur and the skin tone may develop differently across different sections of the face. 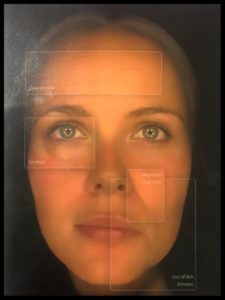 The complexion mode highlights the minute variations in skin tone and light pigmentations and makes the influences of skin tone inhomogeneity on the apparent age far better distinguishable from the topographical aging signs such as wrinkles and sagging skin. Isn’t it incredible! I nearly had heart failure when I seen how bad mine was. 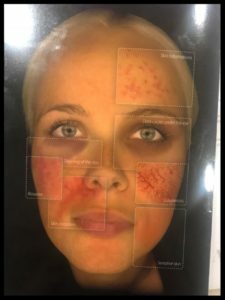 Sun damage itself is irreversible, however, to prevent anymore damage it is very important to always use sun screen, makeup with SPF and limit exposure to sunbeds. 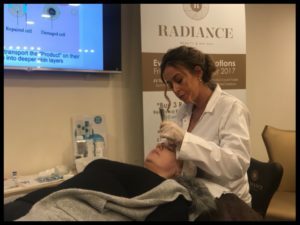 You can however slow down any further damage and help heal and regenerate collagen and with the Radiance Day Spa’s treatments and new skincare range that has all you need, you will have younger, brighter amazing skin in no time! 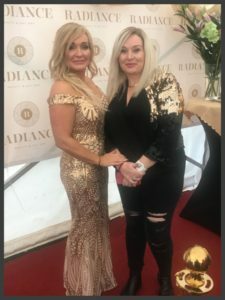 Speaking with Christine at the launch about her products she said how there are so many creams and lotions out there and half of them aren’t needed and don’t work. 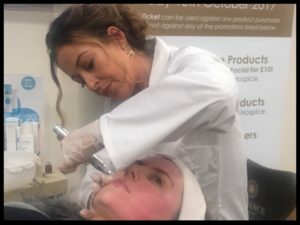 She wanted to create a quality affordable range of skincare that really does work and that achieves the results you would expect from a high end skincare range. I was very kindly gifted with C10 which is a professional strength Vitamin C Serum which offers daily antioxidant protection. From the first time I used the serum my skin immediately felt tighter, smoother and I literally felt like I had a facelift. A week of using it and my skin feels super hydrated and looks brighter and fresher, the serum also acts as an incredible primer. 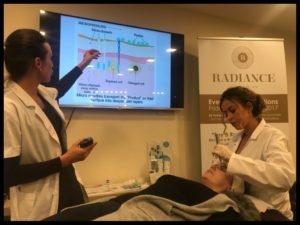 Everyone should get booked in for a skin consultation with one of the very knowledgeable and friendly Radiance staff and get their own tailor made recommendations from this incredible skin care range and services. Radiance is a results driven skin care collection, which has been carefully formulated using clinically proven, highly active ingredients. These products are all paraben free, contain no animal by-products and not tested on animals. 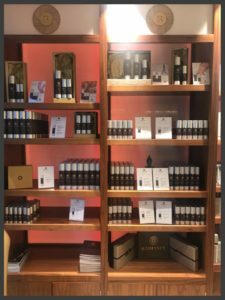 The collection has been designed, developed and produced by a team of dermatologists, scientists and pharmacists to ensure it is the best in its field. The 11 products target the different skin concerns commonly experienced by men and women, with products tailored to suit all skin types. 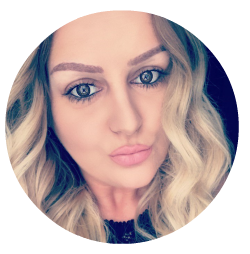 Christine said “as a busy business owner and working mum, I am continuously multitasking, which leaves me with very little time to look after my skin. Good skin health is important to me but I need something which is quick, and fits in with my busy working life. As a qualified therapist working in the beauty industry, an educator and clinic owner, I found most skincare brands involved the laborious application of multiple products, involving long rituals. 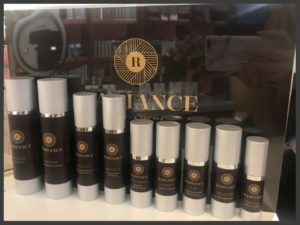 This led me to create and develop Radiance skincare, a clinically proven range of products with multiple active ingredients, tailor made for different skin types.